I don't do a lot of baking at Christmas time (or really ever) but I really want to start. Some of my sweet neighbors brought over a thing of goodies last night. As Harper gets older I want to bake with her and make that a tradition. I know a lot of us always have cookie exchange parties to go to this time of year. So let's get some good ideas - share your cookies, fudge, treats that you make this time of year! YUM!!! Can't wait to see all of the recipes! Thank you! McLinky won't let me post until 7:51pm eastern time? It keeps changing the time though, weird! I can't wait to see/drool over all the recipes! :) But what's up with MckLinky not working??? Me either. It keeps changing the time. I'm with you guys! It does keep changing the time. I hope it works soon! I can't wait to see all the yummy recipes! Can't link - it keeps changing the time and saying check back. :-( Looking forward to seeing the recipes once it's working though! I really don't do much baking either! Would love to see some recipes though! My husband and I are hosting our first Christmas.. HELP. I don't do McLinkys, but here is a helpful tip for you...Betty Crocker Sugar cookie mix! Seriously the best and easiest sugar cookie mix I have found. That way you can get straight to the fun part of decorating the cookies (which is all my kiddos care about anyway!) That, and stock up on sprinkles after each holiday...that is what makes for fun (albeit messy!) holiday baking at our house! I think the McKlinky is messed up! I hope you can get it fixed because I cant wait to see all the recipies!! Hey Kelly! I just have one question! What is the deal with tile floors in peoples living rooms there?! I am from AL and the big thing here is hardwood floors! I just didnt know if that was "the style" there or if that's all yall have ever known or what! I just wanted to hear what you would say because your so funny when it comes to things like this!! KELLY! i really think we should keep up the "show us your life" after christmas if there are still ideas to do! i love it! 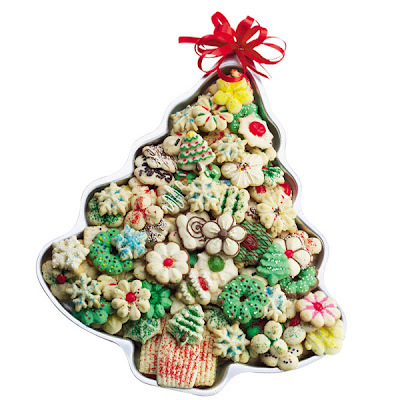 What a creative way to display Christmas cookies! I could use some new recipes. Thanks Kelly! I feel SO behind in my baking! My mom always makes the mini Ritz bits crackers with peanut butter dipped in white chocolate. They are SUPER easy to make, but DELICIOUS! I would love to be gifted in cookie baking...especially sugar cookies...and decorating them...but I am so not! Mine always look hideous!!! I have spent entirely too much time this year anyway eating those Little Debbie Christmas tree cakes...half the time I'm wanting someone to take them away from me, and the other half the time, I'm needing someone to pick up some more!!!!!!!!!!!!!!!!!! THEY ARE SO DELICIOUS!!!!!!!!!!!!! And I only have a couple more weeks to enjoy them!! Well normally I'm good about not craving sweets or baked goods, but that picture just did crazy things to my craving radar ;) thanks, Kelly, I was TRYING to not gain my normal five pounds this winter!! Oops, I scrolled too far down your blog and thought this was McLinky for Christmas Decorations. You can remove my link, sorry!